There are two ancient Cowal churches dedicated to St Mary, the Blessed Virgin. The medieval church of Dunoon (where the High Kirk now stands) was one of them. In 1402 John Stewart, lord of Achagowyne, granted some land to ‘Saint Mary the Virgin and her parish church of Dunoyng’. Another church dedicated to the Virgin was the now ruined parish church of Strathlachlan, close to Castle Lachlan. Here the name of the church bears witness to the dedication, for it was Kilmorie, Gaelic cill Moire or ‘church of Mary’. As well as these two churches there was also a chapel of St Mary in Carrick Castle – probably a tiny place designed to serve only the household of the castle. Some of the earliest art and poetry from Gaelic Scotland expressed devotion to the Blessed Virgin. The famous Book of Kells, probably made on Iona around AD 800, has a glorious full-page illustration of Mary with the Christ-child. 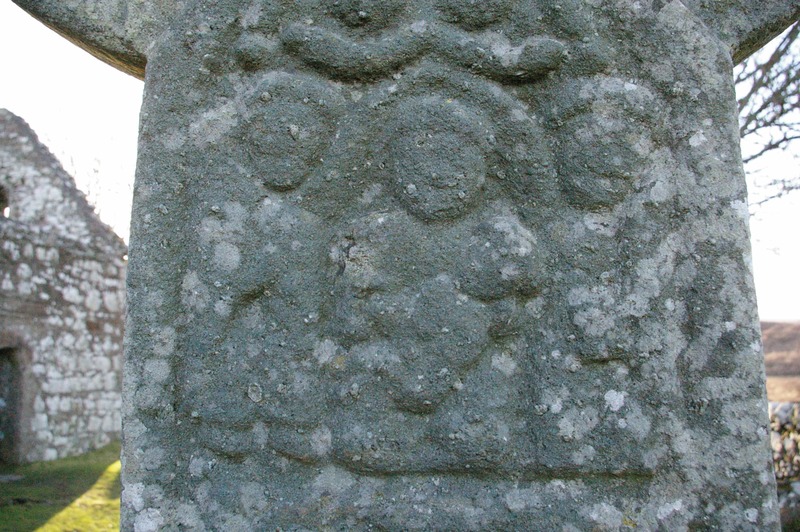 In the church of Kildalton on Islay there stands a carved stone cross, possibly made about the same time. Directly below the centre of the cross is an image of the Virgin flanked by two angels, each of them holding a protective wing over her. She holds the Child Jesus, offering him for the worship of the viewer who may be standing or kneeling before the cross in prayer. Her implicit message is, ‘See, here is your saviour’. The fact that this scene is immediately below the centre of the cross reminds the viewer that the salvation that this child will bring is through his suffering, death and resurrection. There is preaching in this image. 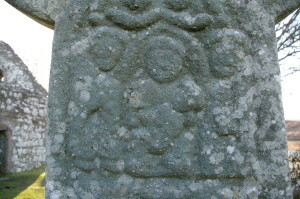 The Virgin and Child flanked by angels who spread their wings over them. The Virgin appears in early poetry too. Cú Chuimhne of Iona (died AD 747) wrote a fine poem in her honour. Here Mary is celebrated as mother of Christ, as the one through whom the eternal, omnipotent and unchanging God became human, a powerless child. together proclaiming to God a hymn worthy of holy Mary. so that the voice strikes every ear with alternating praise. fitting care she gave to languishing mankind. it was conceived and received in the Mother’s womb. who by faith did not draw back, but stood forth firmly. not one of all the descendants of the human race. by the power of a woman it has returned to salvation. through whom the whole wide world, washed by water, has believed. for which sensible Christians have sold all they have. Christ’s death accomplished, it remained thus by casting of lots. that we might be perfected by God, taken up by Mary. that the flame of the dread fire be not able to ensnare us. that we may delight and be inscribed in letters in the heavens. So Cú Chuimhne celebrated Mary as the Christ-bearer, and we are invited to find salvation by rejoicing in his birth. But early Gaelic poetry marked another darker aspect of Mary’s story – the moment when she stood at the foot of the cross and watched her son die. A seventh-century poet called Blathmac mac Con Bretain invited his readers or hearers to join Mary in ‘keening’ over the death of Jesus. Keening was the ritualised weeping and lamentation over the dead (Gaelic caoineadh). For Blathmac her grief and horror serves as a sign of faith and salvation, and the reader of the poem must grieve too, as does the whole of creation. This is the only faithful reaction to the suffering and death of her innocent Son. that I may keen with you your very dear one. he who was a great diadem, a beautiful hero. it did not lessen your virginity. A stream of blood gushed forth – severe excess! in the tree-tops of every great forest. it is incumbent on them to keen him perpetually. in an eternal kingdom with eternal perfection.